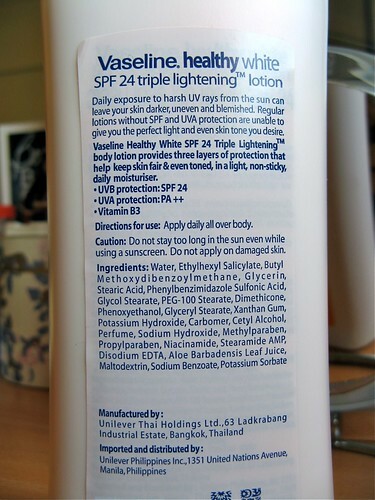 A PR company sent me a 200ml bottle of the Vaseline Healthy White SPF24 sunscreen AGES ago, like half a year ago. For some reason or other though I never blogged about it, which is sad, because this has become an indispensable part of my skincare regimen. I actually finished off the huge bottle, so I purchased a 350ml one! 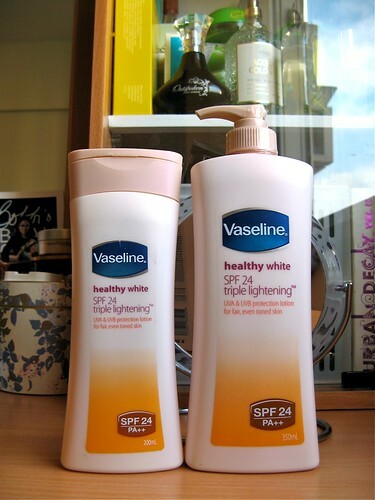 I love this mainly for its SPF 24 UVA/UVB protection. 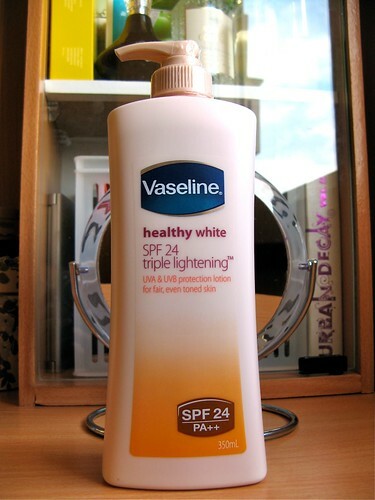 I never go outside the sun without slathering it on my skin. I know there are other SPF lotions out in the market, but this is perhaps the most affordable with a high SPF rating minus the thick sunblock-y feel. It has a lotion-y, slightly floral scent that I don't find overwhelming. As for the texture, it's certainly lighter than the usual sunscreen/sunblock lotions, but you still have to really spread it around to get rid of the white cast. It dries quickly, but it gets slightly sticky if your skin sweats or gets wet. Nothing I can't live with though. Those cons really come with the SPF territory, plus it's hard to complain for the price. I got my 350ml bottle for less than P300 - that's a great deal since it's biiiiigggg. It comes with a pump too! What's your favorite daily SPF lotion?